Desktop magnifying lamp - Order online. These can be an advantage to people who are eye sight impaired or have low vision. Also helpful to those in electronics, coin and stamp collecting, jewellers, embroiderers, jewellers, medical or clinics. Apologies this model is no longer in stock. Features: Round 12.5 cm Glass lens. 2.25 times Magnification (5 dioptre). Fluorescent round 22 watt globe. Bracket handle to ease adjustment of Lamp. Power specs - 240 volts, 22 watt, 50 Hz. Supported by a 12 month warranty. CAPG002B Black Magnifiers with Lights. CAPG004W Lamp with Large rectangle Magnification Lens. CAPG005 Portable Desk Table Lamps. Light in weight. CAPG005 Portable Magnifiers with bright white Lights using 60 LED diodes. CAPG006B Table Lamps with Fluorescent Lighting and flexible arm (black). CAPG008B Black Table Lamps with 22 watt Fluorescent Light and 5 dioptre Magnification Lens. CAPG008W White Table Lamps with 22 watt Fluorescent Lighting. Often used by Beauty Salons. CAPG010 Strong Fluorescent Light with large 5 dioptre Lens plus an additional removable small 12 dioptre Lens. 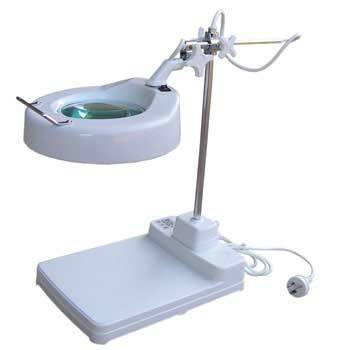 CAPG040 This LED Desktop Magnifying Lamp has a large 5 dioptre rectangle Lens. The Lights consist of 108 LED diodes. Includes Bracket. CAPG041 White Floor Lamps using LED Lighting. CAPG091 Floor Lamps with LED Lighting. CAPG005L 12 watt Fluorescent Light bulb. CAPG051B Larger Bracket for rectangle Lens Lights (black). CAPG051W Larger white Bench Bracket. CAPG052B Black Bracket for round Lens Lights. CAPG054 22 watt round Fluorescent Light bulb. CAPG053 9 watt replacement Light bulb. CAPG053A 9 watt replacement Light bulb. CAPG056 Fluorescent Light bulb (28 watt). CAPG057W White permanently fixed Bracket. CAPG057B Black permanently fixed Bracket. All items can be organised for delivery Australia wide. We accept payments online through PayPal, Visa or MasterCard. Internet Banking or cheque also catered for. is available by calling on (02) 6162 1950 or by email. * Fixed Bench top and Stand alone Pedestal Light models are available. * Every item is on display at our store in Canberra.